Hecatia Lapislazuli (ヘカーティア・ラピスラズリ, Hekātia Rapisurazuri) is a Goddess of Hell. Hecatia appeared as the Extra Stage Boss in Legacy of Lunatic Kingdom. According to Eiki Shiki Hecatia is eccentric but relatively not evil compared to most denizens of Hell. Additionally, it might be possible that her personality changes when she switches between her three bodies. 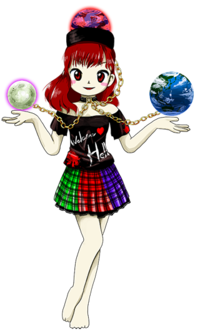 Hecatia's ability allows her to exist on Earth, the Moon, and the Otherworlds all at once with different bodies, while her core soul resides in Hell. As places like Gensokyo and the Dream World are Otherworlds, Hecatia can access these, as well. Her full name is Hecatia Lapislazuli (ヘカーティア・ラピスラズリ). Her given name, Hecatia, is derived from Hecate (Ἑκάτη, Hekátē), the Greek goddess, whom Hecatia is believed to be based on. Her last name, Lapislazuli, is the name of a stone prized since antiquity for its rich, deep blue color. She seems to be based on Hecate, who was associated with the underworld in myth through forms of magic, like witchcraft, necromancy, and sorcery, ghosts, thresholds and crossroads, and the border between worlds. She was also associated with dogs, light, the Moon, and knowledge of herbs and poisonous plants. Her Roman depiction, Trivia, was similar, along with being associated with graveyards. Hecate is also commonly depicted with three heads or bodies, representing crossroads. Hecatia appears within the Dream World with red eyes and hair. She is fairly modern looking, wearing a short, three-colored, plaid skirt, and a black t-shirt with "Welcome ❤ Hell" written on the front, worn off her shoulders. She also wears a collar, with chains attached, each one leading to an orb of the Moon, the Earth, and an orb representing the Otherworlds, the last of which sits in her hat atop her head. During the course of her fight, her hair and eyes turn blue or blonde as she switches the Otherworld orb with the Earth or Moon orbs respectively. As it mentioned in the liner notes to her theme, her outfit is inspired by Death Metal. ZUN thought of the process "Hell -> Shinigami (death gods) -> Death -> Death Metal". Although she is shown barefoot in her in-game portraits and various manga appearances, she is seen wearing boots in Chapter 13 of Visionary Fairies in Shrine. Shortly after the events of Legacy of Lunatic Kingdom, Hecatia brought Clownpiece to Gensokyo and asked her to stay there and get used to the place. In Chapter 10, Hecatia appears in Gensokyo again to check on Clownpiece, and assigns her a new task asking her to encounter more lifeforce, especially from things that aren't often seen in Hell. In Chapter 13, she meets Reimu Hakurei and Marisa Kirisame, and talks with them about the stone cherries that are appearing in Gensokyo, affirming that those stones are nothing but the crystallization of the missing fairies' lifeforce, and saying that she wants to take them with her to Hell. Hecatia, like her would-be friend Junko, has a grudge with Chang'e. It was Chang'e's husband who shot down the sun, and without the sun, Hell can't exist because shadows become weak. However, it mostly seems to be through Junko's influence that her grudge exists. 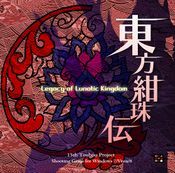 Because she sympathized with Junko, she decides to side with her in Legacy of Lunatic Kingdom. Clownpiece is a subordinate of Hecatia, who allows Junko to use Clownpiece in her scheme against the Lunar Capital. Due to Junko sometimes jumping in during the fight, Hecatia has the lowest number of spell cards as an extra stage boss. Most extra bosses will have ten, but Hecatia has eight. According to ZUN, Hecatia is "completely past the level of anyone in Gensokyo or the Lunar Capital." A mysterious god who governs the Hells of the moon, the Earth, and Otherworlds. She has a separate body in each of the three worlds, and can act independently with each of them. she's a rather troublesome god who can't easily be retaliated against if viewed as an enemy. The Dream World falls under 'Otherworlds', by the way. She too is a god who hates Chang'e. Because, you see, Chang'e's husband was the person who shot down the suns (ie. Apollo). In the first place, Hell would be unable to exist without the sun. Without strong light, the darkness of Hell would weaken too. ...that said, though, her hatred of Chang'e is mostly due to Junko's influence anyway. who could freely move to and from the Dream World. Those conditions fit her perfectly. She and Junko hit it off immediately. It was to her merit that she greatly enjoyed fighting to begin with. She also allowed Junko to freely use her subordinate, Clownpiece. And so, the moon's people escaped into the Dream World. She filled the surroundings of the Dream World's fake Lunar Capital with life. Thus, the People of the Moon were completely suppressed. but, all of a sudden she received a notice of defeat from Junko. It seemed that the People of the Moon came up with a strategy that ran circles around hers. Namely: a purified human who had become free from death. The strategy to send a "Human of the Ultramarine Orb" to the moon. This page was last edited on 27 January 2019, at 21:45.